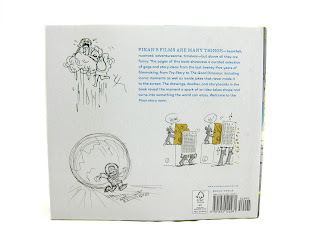 New from Chronicle Publishing, the folks behind your favorite "Art of" books, comes FUNNY! 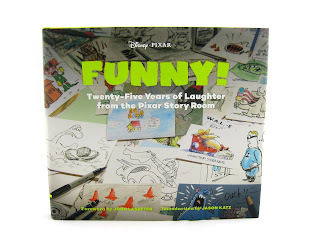 Twenty-Five Years of Laughter from the Pixar Story Room. Contained in this gem you'll find 165 pages of hilarious sketches and drawings from Pixar's best story artists, featuring many previously unreleased "gags" and funny ideas that never even made it past the cutting room floor (or past the walls of the story room for that matter- that is, until now). After a heartfelt forward by John Lasseter and an insightful introduction by Jason Katz (a veteran at Pixar Studios in the art and animation departments), the book gets right into the art. From Toy Story though The Good Dinosaur, this book contains abandoned gags from all 16 of their feature films! This book is made up almost entirely of visual jokes (that read very much like if you were reading the "funny" section of the newspaper) with very little text beyond who the artist behind each drawing is and a few behind the scenes tidbits. Many of the doodles are laughed out loud funny; some you wonder "how did they not put that in!?" While some...well, you understand why they didn't make the cut. To be fair, however, I'm sure many of the jokes were not ever meant to be serious candidates, but rather the story artists just kicking around some chuckle worthy ideas for their own fun. Anyway- enough of me talking about it, it's time to show you some of the fantastic pages you can expect to find! 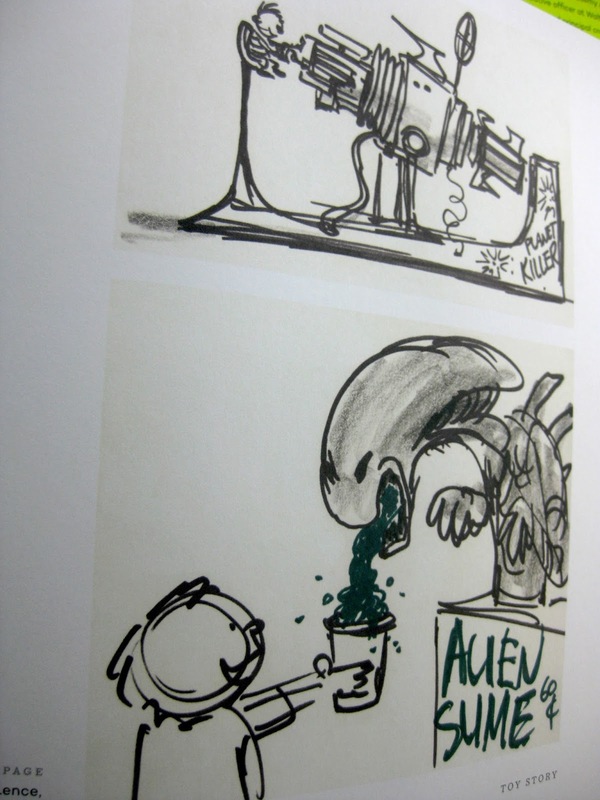 The Pizza Planet "Alien Slime" beverage machine (seen in the sketch above) is an example of a gag that you'll recognize from the final film. I found so many of the Finding Nemo gags to be pretty hilarious (such as the hermit crab and pearl oyster ones above)...I wonder if any of these old jokes will find their way into Finding Dory this year! The Mrs. 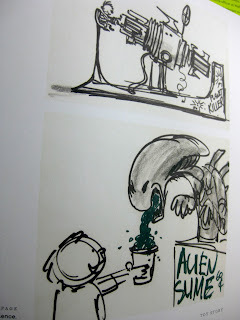 Incredible turned boat gag above is another example of a concept that made it from story room to animation to final cut. The Frozone cooling the beers joke is an example of one that, while funny, was maybe deemed a little too edgy for the film. As you can probably tell, this is an absolute must have for Pixar fans. I absolutely love what they did with this! What an incredible peek into the Pixar story process and the tremendous heart that is put into making the signature Pixar humor we know and love. And of course, this book barely scratches the surface of the thousands of abandoned jokes gathering dust in the Pixar archives. Could we see a volume 2 in the future? Time will tell! Be sure to snag your copy of Funny! on Amazon using the direct link below (currently on sale).